PORTLAND, Maine--(BUSINESS WIRE)--Districts’ efforts to teach mathematics are often stymied by the static nature of textbook content, which cannot adjust to different teachers’ and students’ needs, tends to go out of date as standards change and takes years to be produced or updated. To help districts and teachers better address the particular dynamics and needs of their school systems, classrooms and student populations, Walch Mathematics has created the patent-pending Curriculum Engine™, the first platform that fully enables the on-demand design, editing and publishing of coherent, authentically-aligned high school math courses that districts will own outright. 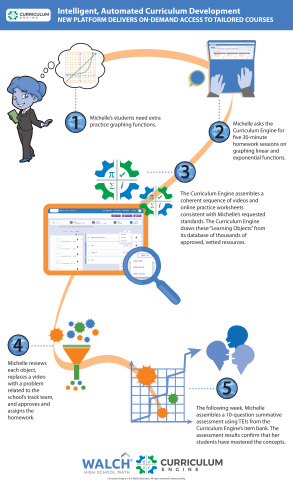 Walch will be launching the Curriculum Engine at the National Council of Teachers of Mathematics (NCTM) national conference (Booth 1203) in San Diego, starting April 3.